Not much is known of the young man that is Kei Silex, only what he has told others; that he is nothing but a simple man, a simple man that loves mining and farming, but mining most of all. When the obelisk thrust him into the world of Atlas, on the 91st day of Timberland, 422 ACE, he was severely wounded and barely made it to the boat that would whisk him away to Nauru. Kei doesn’t really remember anything about his arrival. What he does remember is waking up weeks later in the Nauru Infirmary, incredibly sore and groggy and clueless of where he was. The doctors and nurses told him it was a miracle he even survived his wounds, but the damage would have lasting effects on him for the rest of his life, physically and mentally. If anyone asks the nurses of the Nauru about him, they will say he was pleasant and friendly, but will become pale, tense and tight-lipped if asked anything about the man’s injuries, particularly what's under the eye-patch. Eventually, he was released from their care, and thus the simple miner began his journey from Nauru to the land of Atlas. Despite being somewhat of a ‘fish out of water’, due to being a secluded man in his old world, Kei Silex seemed to adapt well to this strange new land. He didn’t seem to talk much to others, but when he did, he was pleasant and kind unless you were a threat. It took some time until he finally joined a nation, eventually joining the nation now formerly known as the Kingdom Of Aerilon and finding residence in Aerilon Village; a quaint little village on the river pretty much round the corner from Riverguard. 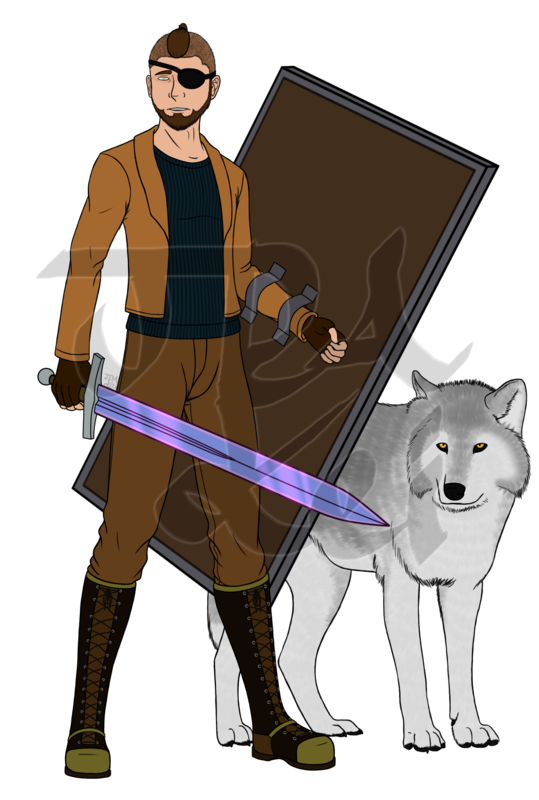 His canine companion, Jubilee the wolf, was found on the way to Yukrovia. Kei had left Kimara Village on the 319th of Cyros, 422 ACE to make the arduous journey to Yukrovia by foot. He wouldn’t arrive in the Northern town until the 380th of Cyros, 422 ACE, and didn’t arrive alone; a gorgeous light grey and white female wolf was by his side. Kei has been reluctant to tell how he tamed the wild animal, only that when he found her she had been completely alone, no pack around for miles, and he simply couldn’t leave her there to starve to death. Jubilee is fiercely loyal to Kei, always by his side and will defend the man with her life if she has to. The miner has come a long way from his beginnings, now a capable warrior (though he’d sooner admit he still has a lot to learn about combat) despite his, handicaps. And now, this simple man is now a leader of a nation, the nation of Zalkeor, formerly the Kingdom Of Aerilon. Kei only hopes he is capable enough to follow through with his intentions for Zalkeor, and give fellow refugees a safe place to call home, much like Kingdom Of Aerilon had done for him so many moons ago.